With routing, we are dealing with three issues. 1. Wind changes over time. Here VMC gives the perfect solution. 2. Wind is different in space. Think weather map. VMC is sorta OK I guess. 3. Forecasts change over time. VMC is actually useful here. Anyway this post is all about the first point. 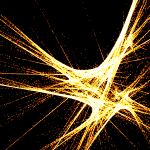 I can express the boatspeed as the sum of two vectors. A forward, or ‘made course’ vector, in this case 280 degrees. And a sideways (or normal, lateral etc) vector, in this case 10 degrees (280+90=10). We can now look at a moving boat in the SOL client. Because the point is to maximize the ‘made course’ vector, the orange line must be a tangent of the polar. Next we look at the course the boat would take to the first mark. The boat will tack at TWD 280. As a practical matter it’s easier to guess the TWD at the tack and use that as the VMC target. There’s two points here. First there must be a unique VMC target to get to any particular point. Aim wrong, you miss. Second it is simply impossible for a different course to get ahead of the orange line. To reach the line all boats have to travel the same distance in the ‘made course’ direction, and pink has optimized speed in this direction. When the pink boat reaches the mark, all other boats must be behind the orange line, thus pink is leading. Hence a perfect solution. The VMC curve is smooth and easy to work with. And when tactics matter, it becomes massively important again. But that’s for another day. 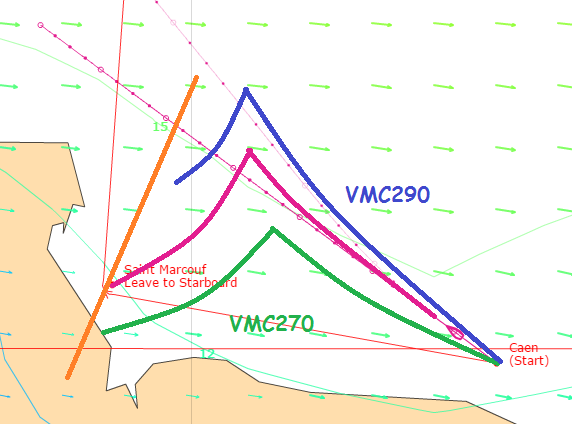 The example you gave here is the simple case of finding VMC (Velocity Made good on Course) when we only have two marks to compulsory pass, a Start Line (in SOL, a Start Waypoint) and a Mark to round (in the example, also an Island). Let’s call it the “VMC, A to B” case. there is only one solution that minimizes the sailed time from “A to B”, or by other words, only one path that maximizes the “VMC, A to B”. 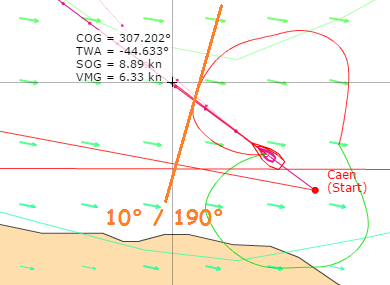 Let’s also remember that “VMC” (in general) depends not only on the boat characteristics you sail (TWS;TWA -> BS or the Polar), but also on the target you want to reach. If for a short distance, like the one you gave on this example, it is pretty obvious the VMC solution and respective conclusions, for a longer path, in open waters, without any geometric limitations (ex. : race marks to round) exception made to the ones imposed by having land, and a changing Weather, the simplicity of the solution of your example is not so immediate. To where do I sail or, where is the next point “B”, is the big question? Again, this will takes us to the router talk. You are correct, if overthinking things a bit. One needs to understand that in the 6 hour timeframe the difference between “constant course” or “constant TWA” and a “VMC course with a constant target” can easily be minutes on the hour. It’s possible to get a little edge with a “VMC course with a floating target”, that is at best seconds on the hour. As such I think that a constant VMC target for each 6 hour wx window is perfectly adequate. And of course that still leaves the matter of “where do I want to go?”, which is a rather big deal. Which takes us, the “…constant VMC target”, to the million Euros question: “B”, where is it? or, as already mentioned the router talk. The one that works. Router helps. 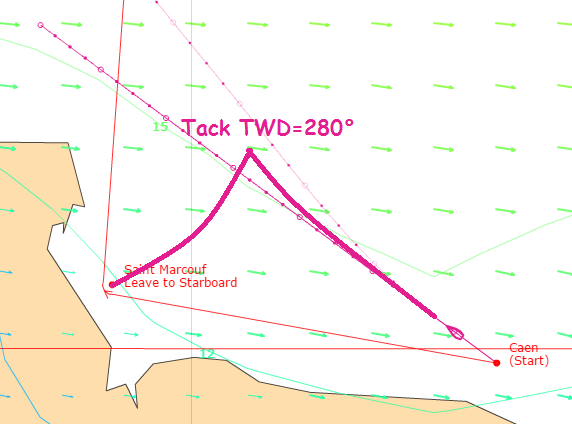 TWD @ next tack – as in the example, and much of the short round the buoys type stuff. Bearing to primary opponent +- 90. I need to explain that some day.